The Blockchain Transparency Institute has released its December Exchange Volumes Report, delving deeper than ever before into suspected wash trading. The conclusions paint a rather damning picture. 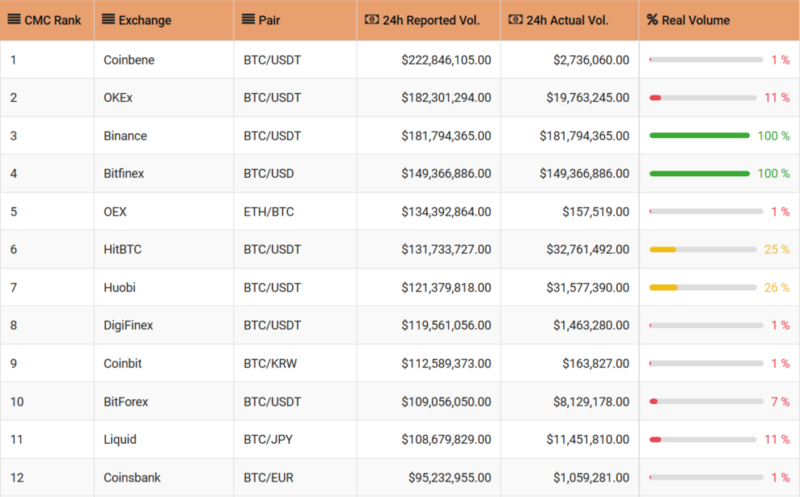 Only 2 of CoinMarketCap’s top 25 BTC pairs aren’t massively inflating actual volume. As part of the report, the Institute used its algorithm to calculate the true volume of the CMC top 25 Bitcoin trading pairs. It discovered that the vast majority of these have an actual volume of under 1% of that reported on CoinMarketCap. The only exchanges not found to be massively wash-trading were Binance, who also topped the November exchange rankings, and Bitfinex. The report found almost all of OKEx’s top 30 traded tokens were engaged in wash trading, along with the majority of top 25 trading pairs at Huobi and HitBTC, to a slightly lesser extent. An investigation into Bithumb uncovered a large amount of wash trading in Monero, Dash, Bitcoin Gold, and ZCash. The wash-traded token of preference seems to change on Bithumb depending on the month. All of these exchanges now appear on the Institute’s Exchange Advisory List. The list comes with a warning to contact the Institute before paying large listing fees to any of these exchanges. The report suggests that these exchanges use wash-trading as a business model to steal money from aspiring token projects. Data suggests that an average project spent over $50,000 in listing fees to exchanges on the advisory list this year. This totals over $100 million stolen in 2018 via listing fees, with some exchanges making over $1 million from this alone. The Institute has also collated data on fair listing fees for exchanges not using bots to wash-trade and urges projects to contact it for this information. This report has come a long way since the initial findings in August, focussing mainly on web-traffic. November’s second report added figures on mobile usage and API traffic, and this one goes even further in its data point analysis. The Institute has identified four different bot strategies and reverse-engineered the settings into its algorithms. In 2019, it will continue to maintain these algorithms to stay ahead of bad actors. It also plans to release an Investor Security Report. This will address current security measures individual exchanges implement and working with the exchanges to improve these. Do you think the report findings are accurate? Share your thoughts below! PREVIOUS POST Previous post: Security Check: Can Chrome Email Tracking Extensions Store Your Private Emails?